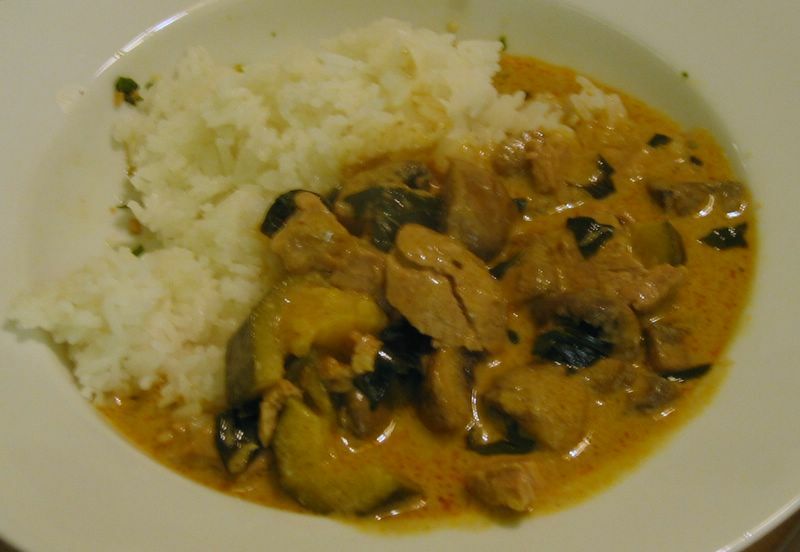 Posted by cath in freeze-friendly, Recipes, thai curry, Thai food, very spicy. There seems to be some more interest in Thai food again, and I guess this is as good a time of year as any to have a special treat of some imported ingredients. Check out your local Thai or Asian supermarkets for the specialty items, substitutions are OK too – so it depends how authentic you want to be. Here’s my recipe, adapted from a traditional Thai recipe from Chiang Mai Thai Cooking School (Chiang Mai, Thailand). I would definitely recommend making your own green curry paste – and this is a slightly unusual and delicious recipe. You can make the paste in bulk and freeze it in portions (for up to a year in a modern 4* freezer), it takes an hour or two to defrost and is then ready to use. 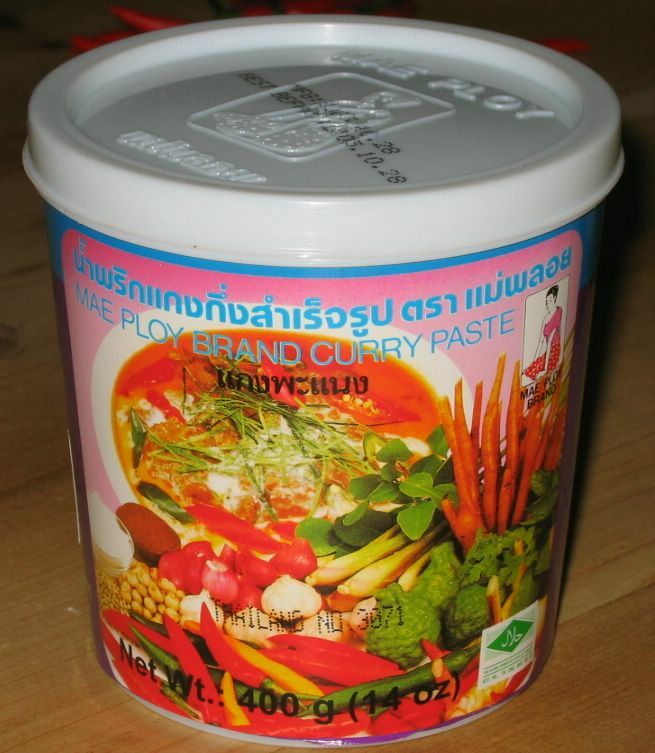 However, if you want to skip the paste, buy a good quality Thai brand of paste (I’m afraid I can’t recommend any in particular as I always make my own) and skip straight to the curry recipe. This makes 1 large portion of paste, for curry serving 4-6. I usually triple or quadruple the quantities here and blend it all together in a small food processor. If you really want an arm-muscle workout and to be 100% traditional you can pound the ingredients together in a large pestle and mortar until smooth. Check out my notes via the hyperlinks if you need to know more about the Thai ingredients, how to recognise them and prepare them. Blend the ingredients for about 10 minutes in a small processor, scraping down the sides occasionally to get a smooth paste (or longer by hand with a pestle and mortar). It’s worth ‘roasting’ the seeds to release more flavour. Do the coriander seeds first, they are bigger and will take longer to brown. Do the cumin seeds separately, else some may blacken whilst the coriander is yet to brown. Do not use burnt seeds in the recipe – chuck them away and try again! Place the seeds in a dry frying pan or wok on low heat and shake occasionally. They will gradually brown – be careful not to leave them as they will burn. Coriander seeds may take up to 20 minutes. For cumin seeds 5-10 minutes should be sufficient. As they are ‘roasting’ they should start smelling more aromatic and slightly darken in colour, however this can be hard to tell – especially with cumin seeds, so watch them carefully lest they blacken. You can grind all the roasted seeds together in a pestle and mortar once they’ve cooled. 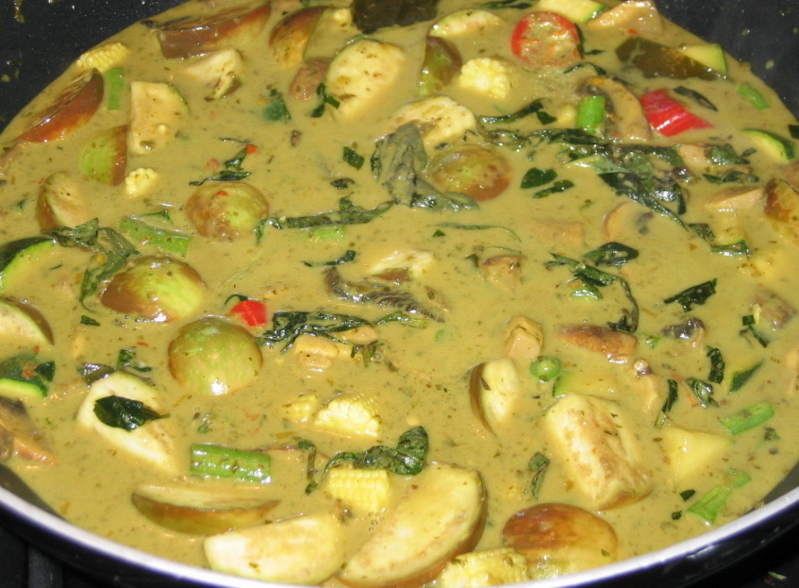 Posted by cath in freeze-friendly, ingredients, Recipes, thai curry, Thai food, very spicy. Perhaps the most well known Thai curry in the UK. I have a slightly different recipe which recreates the hot, spicy, sweet and sour curry without as much salt as many shop-bought pastes. I’ve adapted this recipe from the one I learned in a Thai cooking school. It’s interesting to note that it is not the usual recipe you see in books, the special ingredient we were taught to include in the curry paste is Thai Sweet Basil. This is a good time of year to pick up some imported items for a change – if only to avoid another portion of cabbage! First, heat up the oil in a pan. Then add the green curry paste and fry for about 4 minutes until the paste is cooked. Then add most of the thick coconut milk and mix in until you form a thick, smooth curry base. If your home-made paste is a bit coarse, you can liquidise this mixture to create a smoother look. Bring the curry base up to a simmer and add the thin chicken slices. Keep simmering gently for about 5 minutes until the chicken is nearly cooked through. As long you’ve cut the chicken strips thinly, this shouldn’t take too long. Cut and add the apple egg plants and bring to the boil again, simmer for about 4 minutes more. Add the pea egg plants and simmer again for a few minutes. Then add the fish sauce and kaffir lime leaves, stir and heat through. Turn off the heat, transfer into a serving bowl (if required) and garnish with big chillies, basil leaves and dash of lime juice to taste. For a fancy finish: add a swirl of the leftover coconut milk by re-combining some thick and thin coconut milk in a small cup, pour some into the centre of the serving dish then quickly and gently stir to create a swirl of white against the green base. Beef steak, cut thinly can be used much like chicken, or cooked for even less time as you prefer. Prawns take a very short amount of time and therefore should be placed in the curry sauce last, for 1-2 minutes to cook. Monkfish is excellent in this dish, and needs less cooking than meat, add the chunks of fish about 5 minutes before the end of the cooking time. Other white fish also works well. Left-over roast meat (beef, chicken etc.) can also be used, just thinly slice and add to the sauce for 1-2 minutes to heat through at the end. Pork benefits from a 30 minute pre-cook in thin coconut milk, see the panang recipe for more details. Add other vegetables as well as or instead of Thai aubergines. Green curry makes a good vegetarian option, although you will have to miss out the fish sauce and replace this with soy sauce for strict vegetarians. Also make sure you miss out the shrimp paste from the curry paste. Baby corn, mange tout, courgette, purple aubergine, carrot, potato, cauliflower. I must admit to being a bit of a cheater on this one…I have a great recipe for Panaeng curry paste, but I've got into the habit of buying it from the Thai or Chinese supermarket as, unlike some bought pastes, this one has a really authentic flavour…its Mae Ploy Brand, the variety they call "Panang Curry Paste" has a blue strip at the top of the label. They do a whole selection of curry pastes, but the Panaeng is exceptionally good. Keep your tub of Panaeng paste in the fridge, it will last for ages. Put the pork into the saucepan with the thin coconut milk and water. Make sure the pork is covered by the liquid, then bring to the boil and simmer gently for 30 minutes. Stir occasionally. Put the oil in a wok or large saucepan and fry the Panaeng curry paste for about 4 minutes until cooked. Be careful at this stage not to burn the paste. Frying the paste produces a strong, spicy smell so you might want to close the kitchen door, turn on the extractor fan or open a window! For best results just keep moving the paste around the wok and keep the heat fairly gentle. Once the paste has been frying for a few minutes add most of the thick coconut milk and bring to the boil. Add the cooked pork and all the remaining thin coconut milk from the saucepan and incorporate it into the curry base, bring back to the boil. Add the palm sugar and stir to melt and combine, then add the fish sauce and lime leaves. Stir to combine. Turn off the heat and garnish with basil leaves, chillies and a swirl of thick coconut milk. Serve with steamed Thai fragrant rice. Although traditional Panaeng Moo doesn't often include vegetables, I've found that quartered chestnut/brown cap mushrooms and courgette pieces work really well with this curry. Just add the mushrooms to the curry base, or add both mushrooms and courgette chunks when you add the cooked pork and cook for 5-10 minutes depending how crunchy you like your courgette. Alternatively try adding your own favourite vegetables to the curry and leave a comment if you come up with a good combination! Putting the tins of coconut in the fridge for a few hours makes them much easier to separate into thin and thick coconut milk. Take the can from the fridge and open (being careful not to shake it). Using a knife or spoon handle, push a hole down the side of the tin through the cream to the bottom of the can. Repeat on the opposite side so you have two holes. Then, using the knife/handle to hold open the lower hole, pour the thin milk through it from the bottom of the can straight into a saucepan. Don't worry if some of the thicker milk or cream also gets into the pan, as long as you have some thick milk left to use for making the curry base. Repeat with the second tin.